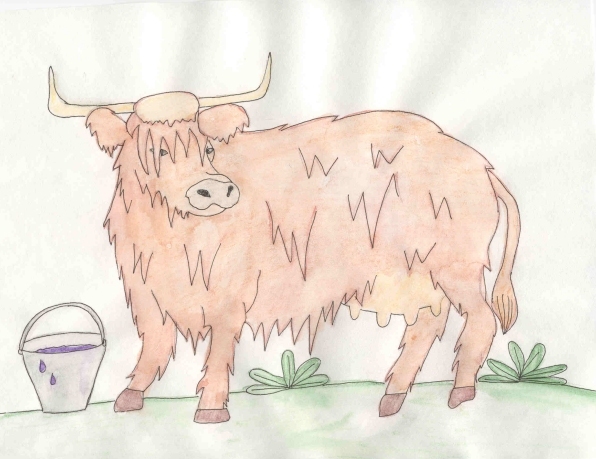 Fiona, the Highland cow, stood in a field of white daisies that were blowing gently in the wind. She ripped the petals off with her teeth and chewed them up. She loved to eat other things too, but daisies were her favorite. The most fragrant and thickest bushes grew along the muddy banks of the stream. During the day, Fiona wandered closer to the stream to find the tastiest flowers. At night, she’d be taken into a shed and Farmer MacHay would milk her. Her milk was always the creamiest, thickest and whitest milk of all Farmer Hay’s cows. One beautiful spring morning, Fiona arose from the pile of hay she slept on, happy about being alive, and happy that she could eat daisies. She wandered down to the riverbank looking for some. She spotted a large clump and began to munch away. Hidden among the daisies was a cluster of purple violets. Not seeing them, she reached her head down and pulled up a few bites. "Yummy. These are the best daisies I’ve ever tasted!" she said. She bent over and pulled up a few more petals, then noticed the violets. "So, that’s what is so delicious. It’s not just the daisies. It’s those purple flowers. They’re yummy." That whole day long, the cow went up and down the stream’s bank looking for violets. She found many of them hiding in the grasses and reeds, and ate every last one. That night, when she was taken into the shed to be milked, she was excited. She knew that the violets would make her milk much creamier. When Farmer MacHay began to milk her, he let out a scream. "Purple milk!" he cried. "I can’t sell purple milk!" Fiona looked into the pail. The milk was as purple as the violets she’d munched on during the day. "No more violets!" Farmer MacHay ordered, and then sent her to her pile of hay in the back of the shed. The next morning, Fiona woke up to the sound of rain pounding on the roof of the shed. When she went outside, the rain pelted down on her, dripping into her eyes, her nose, and her mouth. She walked over and stood under a thick-trunked oak tree. She was watching the stream flow by, wishing she was munching on daisies petals, but it rained for hours. Fiona sat down and was soon so bored that she started looking at all the things near the tree, getting hungrier with every passing minute. She couldn’t reach the leaves on the oak tree, or any of its acorns, and she couldn’t eat the bark. Then she noticed a flowering bush off to the side of the tree. It had brilliant green leaves and was covered with huge crimson roses. She stood up and wandered over to the bush. "Moooo," she went. She could smell the fragrant flowers and they looked so beautiful too. The raindrops cascaded down each delicate petal. When she touched them with her tongue, they felt like soft velvet. She grabbed one in her mouth and chewed it up. "Yummy," she said. "These are pretty good; almost as good as the violets." Farmer MacHay had told her not to eat any more violets, but he hadn’t said that she couldn’t eat roses. So, forgetting about everything else, she munched down every single red rose on the bush. By the time the rain had stopped, Fiona didn’t feel hungry any more. She walked down to the stream and stood, letting the sun beat down on her long, reddish-brown hair. That night, she couldn’t wait to be milked. She went to the shed and Farmer MacHay began to milk her. "Red milk! What is this?" he asked Fiona, showing her the milk in the bucket. She let out a loud "Mooo," and looked into the bucket. The milk was as red as the roses she’d eaten from the bush under the oak tree. "I can’t sell red milk either!" Farmer MacHay said angrily. He slapped Fiona softly on the leg so she would go to the back of the shed. When she woke up the next morning, she knew that she couldn’t eat anything but the daisies that grew along the riverbank, no matter what. But when she neared the flowing waters of the stream, she saw that Farmer MacHay had chopped all the tall grasses and daisies down. All that was left was stubble, lots of stubble. Fiona couldn’t eat stubble. She had not eaten anything since her rose petal meal the day before and was feeling very hungry. What was she to do? It would take days for the bushes to grow tall enough to eat. That day, in a nearby field, she found and ate some yellow buttercups. That night, her milk was yellow. The day after that, she ate some bluebells. That night, her milk was blue. And so it went, with orange pansies, orange milk and with pink heather, pink milk. Farmer MacHay was getting angrier each night. Finally, he told Fiona that he couldn’t use her milk anymore. There would be no more cream, and no more cheeses. Who wants to eat blue cheese? All night long, Fiona stayed awake. She was so sad that her head hung down and her nose touched the dirt. She stood up all night, crying so much that her tears made a puddle around her feet. When the sun came up in the morning, Fiona, still feeling sad, wandered over to the stream. What she saw changed her frown into a smile. She kicked her back legs up in the air and loudly called "Mooo." Growing along the bank, were the most tender-looking, tall, green grasses and little blossoming daisies that she had ever seen. No more stubble! She ate, and ate, and ate. She walked up and down the bank eating the petals off every flower. That night, she went into the shed. Farmer MacHay was about to shoo her out, but thought that he would give her one more chance. He began to milk her. Out came the creamiest, richest, thickest, whitest milk he’d ever seen. "Fiona, my sweet, sweet cow. Now that’s my girl," he said, standing up and softly patting her long, reddish-brown hair. As she stood there, watching the bucket fill with white milk, she knew that never again would she eat anything but daisies, no matter what! And she never did. "Mooo!"